Prayer. That one word that everyone knows so much about, but yet know so little about. The word “pray” simply means “to ask”. Old English used to use the phrase “Pray tell me” when a question was asked. To pray does not imply that we can only ask God for favors. We can ask anyone for favors, especially the saints in heaven, who, contrary to protestant popular opinion, are very much alive and well, not to mention holy. Jesus himself said that God is not the God of the dead, but OF THE LIVING (Luke 20:38). Paul says that the saints in heaven are our witnesses (Hebrews 12:1). Presumably one has to be alive to witness to a judge on behalf of somebody. And prayer should never be like making a long distance telephone call to a stranger when we are in trouble. How would you feel if someone you loved only called you up and asked for favors when they got themselves into trouble? You wouldn’t like it, and God doesn’t much care for it either. Prayer should be like we are talking to our loving Father/our best friend, who really is right next to us all day every day. Most of us don't like it when our kids beg and plead and whine to us parents for things which we will not give them because they are bad for them. God doesn't like it either when we do the same to Him ! Rather, we should just ask God with quiet confidence for what we want (James 1:6-8), knowing for certain that we will get it if it's God's will for us to have it, and that we won't if it is not. And what we should really pray for is for God's will to be our will. Some people get discouraged in their prayers because they see so many successful people all around them who never pray, but who are rich, live in nice big homes, and travel to exotic places all of the time. But remember, God is blessing these people NOW. Christians should never be worried about being comfortable and rich in this life. Christians should just do the will of the Father, which is taking care of your family, feeding the poor, visiting the sick, etc. This is all spelled out for us all in Matthew 25. The ones who don’t get into heaven in those verses didn’t do the work of God that they were supposed to do. By doing the work for God now, we will be blessed in heaven many times over after we die (Matthew 19:29 & John 14:2-3), when it really matters. These 4 different types are mostly ignored by most pray-ers, except for the last one, supplication. Supplication means to ask for favors. Adoration is the best type of prayer, because you are adoring God for what He is – Everlasting, Almighty, All Knowing, All Holy, All Good, All Powerful, The Best Father Ever, etc. Contrition is the next best, because you are expressing sorrow for your sins. Remember the tax collector in Luke 18 who beat his breast saying “Have mercy on me a sinner”. Jesus said that he went home justified, while the self righteous Pharisee did not. The third type of prayer, Thanksgiving, is also very important. How do we feel when we go the extra mile for someone else’s benefit and they don’t even come back to thank us? Jesus cured 10 lepers, but only one came back to thank him in Luke 17:15-16. This was not seen as a positive by Jesus. We all have received many favors from God, so let’s all take a vow to start thanking Him for them all, right now. The truth is that the people who use all 4 types of prayer from the heart have more of a chance of getting their prayers answered than those who just ask for stuff all of the time, like God is some kind of celestial slot machine – You put a few prayers in, and out comes the jackpot, as ordered. Of course, the real purpose of prayer is not that God should be united to our will here on earth, but that we should be united to His will in Heaven. 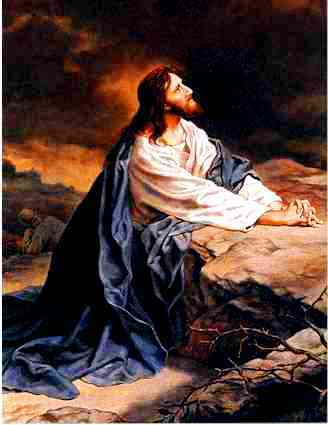 The prayers "Thy will be done" and "be it done to me according to thy word" were given to us by Jesus and Mary. We should not only imitate them in saying these prayers ourselves, but we should also really desire the meaning of these prayers in our lives. One of the greatest examples of the power of prayer was with Abraham, in Genesis 18. He prayed to God to spare the city of Sodom. He started out asking God to spare the city if only 50 righteous people were found within the city. He continued praying and convinced God to spare the city if there were only 5 righteous people in the city. This example proves that God can be moved with prayers. There are other types of prayer that involve meditation and contemplation. Meditation would be to ponder the events of Christ’s life in the Bible, like His passion and resurrection. What suffering he must have gone through, and for who? US ! Contemplation would be to ponder on how the events of the Bible apply to our own lives. The really good thing about these two types of prayer is that absolutely no words are necessary. Only our thoughts on the meaning of the events is all that really matters. In Eastern religions, they empty their mind to meditate, which leaves an opening for satan to put thoughts in their mind which may seem good on the surface. In Christian meditation, we do not empty our minds; rather, we fill our minds up with the events of the Bible, specifically Jesus. Why? Because in Isaiah 53:5, he said that “by His stripes (wounds) we are healed”. Since that is true, we ought to be meditating on the passion, death, and resurrection of Jesus Christ at every opportunity. St. Padre Pio received the stigmata of Jesus while meditating on His passion. The best way to combine these meditations on the life of Christ with vocal prayer, of course, is through the use of the holy rosary, the scourge of the devil. To enhance your prayer power even further, it is very beneficial to say these prayers or meditations in front of the Blessed Sacrament, in a holy hour of Adoration. Keep in mind that the consecrated host is truly the same Jesus who died for you and me 2000 years ago. It’s always troubling that so few people show up for Adoration. If the Pope were to come to your church, a hundred thousand people would show up just to get a glimpse of him, or perhaps shake his hand or get his blessing. But when his boss, Jesus, is in the monstrance on the altar, waiting, only a handful ever shows up. Very strange indeed. And for what should we pray? Praying to win the lottery and to get rich may mean that you want to feed the sin of greed, and God will probably not answer that prayer. Riches can ruin people faster than just about anything, especially getting rich overnight (Proverbs 13:11). The problem with riches is that one tends to put their faith in their money rather than in God the Loving Father. Rather, pray to lose your vices, by name, and to gain the opposite virtue. Pray for healing for yourself and for others. Pray to be more kind, loving, forgiving and charitable. Pray to be able to forgive your worst enemy, all the while praying for his/her salvation. Pray for more grace, and pray for the grace to accept all of the graces that God is sending you. And pray to NEVER sin again, because it offends Almighty God. So how does one go about praising God and thanking God all day? There are only so many times that one can say “Praise You” and “Thank You” before getting tired. Singing is the answer. Learn all of the verses to “Holy God We Praise Thy Name”, “Holy Holy Holy”, “Allelulia Sing to Jesus”, “Hail Holy Queen”, “Immaculate Mary”, “Sing of Mary”, O Most Holy One, etc. Sing these on the way to work in the morning. Sing them in the shower. It will bring you closer to God, and drive your guardian demon crazy, all at the same time! How hard it will be for satan to tempt you while you are invoking Jesus and Mary in these great songs. 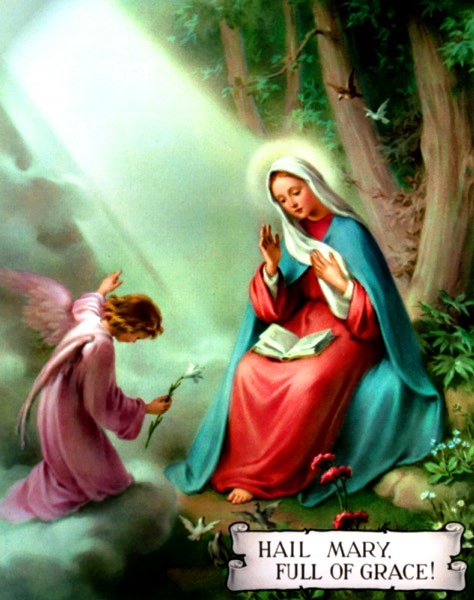 One of the best ways to praise God, by the way, is to praise Mary. Praising something that someone has made is the same as praising its creator. In the Bible, when Elizabeth praised Mary (Luke 1:42-45), Mary immediately started praising God through her Magnificat (Luke 1:46-55). And who better to praise God for us than His own pure and immaculate mother? Fasting is another way to show God how much you love him. In the book of Acts, the apostles fasted and prayed in Acts 13 and Acts 14. We would all do well to imitate them (Hebrews 13:7). And what should we be praying for ? Genesis 33:9-12: But Esau said, "I have enough, my brother; keep what you have for yourself." Jacob said, "No, I pray you, if I have found favor in your sight, then accept my present from my hand; for truly to see your face is like seeing the face of God, with such favor have you received me. Accept, I pray you, my gift that is brought to you, because God has dealt graciously with me, and because I have enough." Thus he urged him, and he took it. Then Esau said, "Let us journey on our way, and I will go before you." Genesis 40:7-8: So he asked Pharaoh's officers who were with him in custody in his master's house, "Why are your faces downcast today?" They said to him, "We have had dreams, and there is no one to interpret them." And Joseph said to them, "Do not interpretations belong to God? Tell them to me, I pray you." Proverbs 21:13: He who closes his ear to the cry of the poor will himself cry out and not be heard. (**NOTE – If you hate the poor, your prayers will not be heard). Sirach 3: 5: Whoever honors his father will be gladdened by his own children, and when he prays he will be heard. Sirach 28:2: Forgive your neighbor the wrong he has done, and then your sins will be pardoned when you pray. Sirach 35: 16-17: He whose service is pleasing to the Lord will be accepted, and his prayer will reach to the clouds. The prayer of the humble pierces the clouds, and he will not be consoled until it reaches the Lord; he will not desist until the Most High visits him, and does justice for the righteous, and executes judgment. Tobit 12: 8-12: Prayer is good when accompanied by fasting, almsgiving, and righteousness. A little with righteousness is better than much with wrongdoing. It is better to give alms than to treasure up gold. For almsgiving delivers from death, and it will purge away every sin. Those who perform deeds of charity and of righteousness will have fullness of life; but those who commit sin are the enemies of their own lives. "I will not conceal anything from you. I have said, `It is good to guard the secret of a king, but gloriously to reveal the works of God.' And so, when you and your daughter-in-law Sarah prayed, I brought a reminder of your prayer before the Holy One; and when you buried the dead, I was likewise present with you. When you did not hesitate to rise and leave your dinner in order to go and lay out the dead, your good deed was not hidden from me, but I was with you. So now God sent me to heal you and your daughter-in-law Sarah. I am Raphael, one of the seven holy angels who present the prayers of the saints and enter into the presence of the glory of the Holy One." (**NOTE – Here one of the 7 archangels, Raphael (God Heals), says that prayer is best when accompanied by almsgiving, fasting, and righteousness. St. Raphael also presents our prayers to God). Isaiah 59:2: but your iniquities have made a separation between you and your God, and your sins have hid his face from you so that he does not hear. (**NOTE- Our own massive unrepented sins block our own prayers from reaching God…See below). Ezekiel 8: 17-18: Then he said to me, "Have you seen this, O son of man? Is it too slight a thing for the house of Judah to commit the abominations which they commit here, that they should fill the land with violence, and provoke me further to anger? Lo, they put the branch to their nose. Therefore I will deal in wrath; my eye will not spare, nor will I have pity; and though they cry in my ears with a loud voice, I will not hear them." 2 Maccabees 12: 42-45: and they turned to prayer, beseeching that the sin which had been committed might be wholly blotted out. And the noble Judas exhorted the people to keep themselves free from sin, for they had seen with their own eyes what had happened because of the sin of those who had fallen. He also took up a collection, man by man, to the amount of two thousand drachmas of silver, and sent it to Jerusalem to provide for a sin offering. In doing this he acted very well and honorably, taking account of the resurrection. For if he were not expecting that those who had fallen would rise again, it would have been superfluous and foolish to pray for the dead. But if he was looking to the splendid reward that is laid up for those who fall asleep in godliness, it was a holy and pious thought. Therefore he made atonement for the dead, that they might be delivered from their sin. (**NOTE – Prayers for the dead are biblical). 2 Maccabees 15: 12-14: What he saw was this: Onias, who had been high priest, a noble and good man, of modest bearing and gentle manner, one who spoke fittingly and had been trained from childhood in all that belongs to excellence, was praying with outstretched hands for the whole body of the Jews. Then likewise a man appeared, distinguished by his gray hair and dignity, and of marvelous majesty and authority. And Onias spoke, saying, "This is a man who loves the brethren and prays much for the people and the holy city, Jeremiah, the prophet of God." Matthew 6:6-7: But when you pray, go into your room and shut the door and pray to your Father who is in secret; and your Father who sees in secret will reward you. "And in praying do not heap up empty phrases as the Gentiles do; for they think that they will be heard for their many words. (**NOTE – Repeating the words of Gabriel and Elizabeth in the Hail Mary ARE NOT empty phrases, but biblical. See Below). Matthew 26:44: So, leaving them again, he went away and prayed for the third time, saying the same words. Matthew 21:22: And whatever you ask in prayer, you will receive, if you have faith." James 1: 6-8: But let him ask in faith, with no doubting, for he who doubts is like a wave of the sea that is driven and tossed by the wind. For that person must not suppose that a double-minded man, unstable in all his ways, will receive anything from the Lord. Luke 6:12: In these days he went out to the mountain to pray; and all night he continued in prayer to God. (**NOTE – If Jesus, who is God, found it necessary to pray, then we, who are no better than our master, should imitate Him in this). Luke 18:10-14: "Two men went up into the temple to pray, one a Pharisee and the other a tax collector. The Pharisee stood and prayed thus with himself, `God, I thank thee that I am not like other men, extortioners, unjust, adulterers, or even like this tax collector. I fast twice a week, I give tithes of all that I get.' But the tax collector, standing far off, would not even lift up his eyes to heaven, but beat his breast, saying, `God, be merciful to me a sinner!' I tell you, this man went down to his house justified rather than the other; for every one who exalts himself will be humbled, but he who humbles himself will be exalted." (**NOTE – Humility is also a prerequisite for prayer to be effective). Luke 21:36: But watch at all times, praying that you may have strength to escape all these things that will take place, and to stand before the Son of man." Acts 10:4: And he stared at him in terror, and said, "What is it, Lord?" And he said to him, "Your prayers and your alms have ascended as a memorial before God. (**NOTE – Like St. Raphael said earlier, almsgiving really helps the efficacy of your prayers. They even become a memorial before God !). Romans 12:12: Rejoice in your hope, be patient in tribulation, be constant in prayer. (**NOTE – Turn off the radio and TV, and pray constantly. Stuck in traffic? Pray for the people next to you. Hear an ambulance go by? Pray for the victim. Does your boss holler at you? Pray for him/her). Philippians 4: Have no anxiety about anything, but in everything by prayer and supplication with thanksgiving let your requests be made known to God. (**NOTE – Praying with self confidence to your loving Father knowing that He will do what is right in every case is much better than pleading with anxiety. In other words, have Total Trust in God to take care of you and your needs, at all times). (**NOTE – Here we are being told to never give up praying, and to do it with Thanksgiving. See below). 1 Thessalonians 5:17-18: pray constantly, give thanks in all circumstances; for this is the will of God in Christ Jesus for you. James 5:13-18: Is any one among you suffering? Let him pray. Is any cheerful? Let him sing praise. Is any among you sick? Let him call for the elders of the church, and let them pray over him, anointing him with oil in the name of the Lord; and the prayer of faith will save the sick man, and the Lord will raise him up; and if he has committed sins, he will be forgiven. Therefore confess your sins to one another, and pray for one another, that you may be healed. The prayer of a righteous man has great power in its effects. Elijah was a man of like nature with ourselves and he prayed fervently that it might not rain, and for three years and six months it did not rain on the earth. Then he prayed again and the heaven gave rain, and the earth brought forth its fruit. (**NOTE – Any person that does not treat their spouse with respect will find his/her own prayers blocked). (**NOTE – As we learned earlier with St. Raphael and Jeremiah, the heavenly hosts present our prayers to God. Here it says that they are in the form of incense. See Below).